The Reverend Stuart Brooks Keith III, or simply Father Brooks, hails from Tampa, Florida. 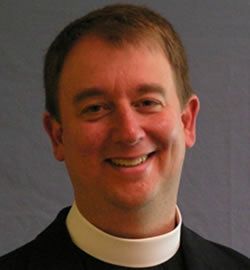 Following a tenure in professional youth ministry in Orlando, Florida, Father Brooks graduated from the Virginia Theological Seminary in 1992, married his wife Julie Papa Keith shortly afterwards and was called to Golden, Colorado as a new priest. He was called to Transfiguration as Associate Priest in 1995 and named Rector in 1998. Father Brooks enjoys leading a dynamic, growing congregation while providing leadership in the diocesan and national levels of the Episcopal Church. He enjoys the Rocky Mountains with his wife and two daughters while remaining an avid reader and fan of science fiction, fantasy and everything Scottish.